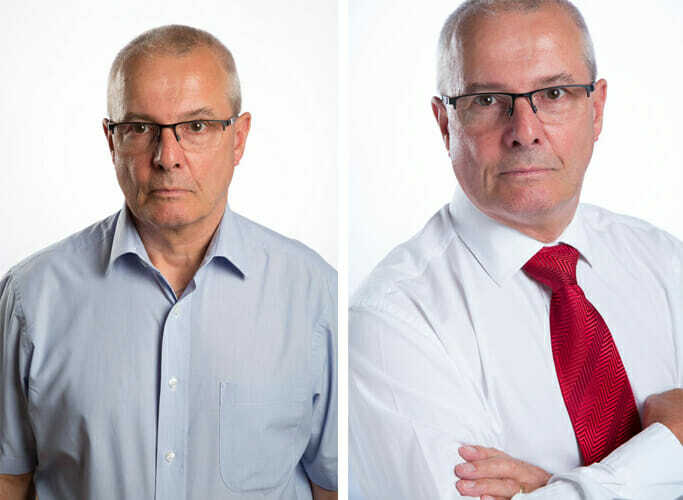 Recently I had a client come in for a business headshot portrait and I thought I would take the opportunity to show you a before and after image. Hopefully you can see what a huge difference professional lighting and direction on posing makes to the image. A business headshot portrait is often one of the first things that a client will see about you and therefore a valuable piece of your marketing. A business headshot portrait has a multitude of uses. As well as being used on your companies internal mailings they can also be used for press releases, your LinkedIn profile, your CV and on your business card to name a few. Background choice on your headshots is also key, white backgrounds carry that professional look. White backgrounds for business headshot portraits are also incredibly popular with companies because of the consistency across all images. What’s more, business headshots really aren’t expensive so, can you afford not to update yours? If you’d like to see what I can do for you, please drop me a message here and I’ll be in touch to talk things through with you.